I just noticed it when I was sending a message to my old school friend who was not a friend of mine on Facebook. 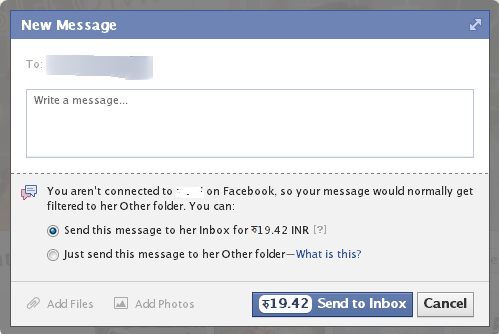 When I hit the message, Facebook gave me pop-up like this to pay some cent of dollar to send my message directly to her. I didn’t believe it at first and to check whether it’s true or not, I took a further step and clicked Send To Inbox, and what appeared is – Payment Details. Now, what about the questions about pricing of Facebook services in Help Center? Let’s see. “We are testing some extreme price points to see what works to filter spam.” In other words, the fee is an attempt to discourage people from sending annoying messages to people they don’t know”. I hope that it’s only a test ;) and won’t be implemented practically! Still, the question is if they’re only testing it then why are they grabbing these bucks implemented on the profiles? 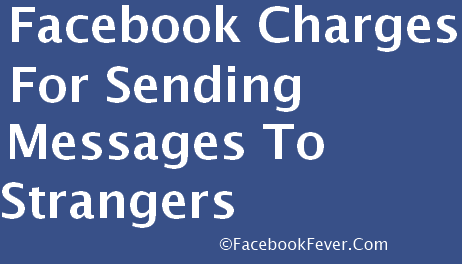 Readers: If they implement in real, will you pay some bucks just to send message to a stranger? Do you feel that the steps Facebook is taking to make some money are right? OR to stop SPAM on the social network site?